"I was attracted by the fact that the job and the course together give you the chance to learn all the different trades." 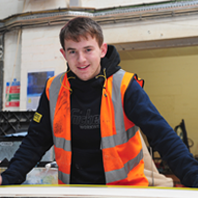 Kieran Dixon jumped at the chance to learn a range of trades when he landed a maintenance apprenticeship through Derby College. Seventeen-year-old Kieran was one of two teenagers chosen after Ilkeston-based Belfield Furnishings gave a presentation to students at the college’s campus in the town. Now he was switched from his Level 2 Diploma in Plastering to work towards a Level 2 Diploma in Maintenance. He said: “I was attracted by the fact that the job and the course together give you the chance to learn all the different trades. Hopefully I can get qualified and go onto Level 3 Maintenance. He studies one day a week in college and works with Belfield on the other four. Richard Newby, HSE and maintenance manager at Belfield, said he received a number of good applications and he was able to take on two candidates.